You may still be able to book by calling the hotel at 212-840-8222. Built in 2000 and in the heart of Times Square, the Hilton is one of the newer kids on the square. Light-colored wood furniture in the rooms is married with neutral tones in the fabric of the bedding, window treatments and walls. The room necessities are there in the 37-inch flat panel TV, MP3 player, coffee maker and Crabtree & Evelyn bath amenities; a large work desk and comfy armchair with ottoman round out the extras in the uncharacteristically large rooms (for Manhattan, that is). Those Times Square lights draw excitement, but when you're trying to sleep, you may appreciate the room's black-out curtains that hang on oversized windows. When you're ready to venture out, you're just minutes away from virtually all that the Big Apple has to offer. 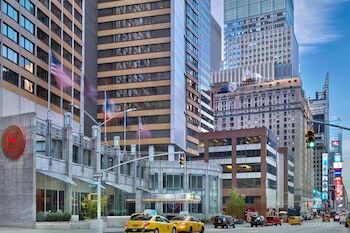 Hilton Times Square is a 4-star hotel located at 234 W 42nd St, New York, NY 10036, US . Its nightly price usually falls between $98 per night and $2369.99 per night, excluding tax, depending on room category. $98 per night found for a Hilton Honors Discount -Honors Discount - 1 King Bed - Newly Renov-Oversized-330 Sq Ft-46-In Flat-Tv room type. 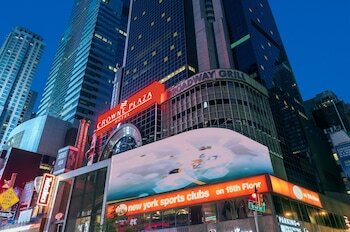 Hilton Times Square sells rooms through sites like Room 77, Expedia, Hotels.com, GetARoom, and many others. Room 77 searches across dozens of different sites to find the lowest discount rates available. The lowest rate we've seen over the last few weeks was found on Room 77. In 1% of the cases we surveyed, all sites offered the same rate. You can compare real-time rates from all of these sites on Room 77. Room 77 is the only hotel shopping site that includes special discounts like AAA, senior, government, military, and corporate rates.